Happy Holidays! Welcome New Apps and Our New Website! We've been busy here at Magitech creating a new website along with several apps in a new product line that we call the "To Go" series. Over the month of November and December we created a series of sports and entertainment game apps that can help bring families together over the holidays. Grab up to four friends and challenge them to a balloon popping showdown in Balloons To Go. Enjoy fun visuals and music and see who will be the balloon popping champion! In Soccer To Go, we've replicated a stadium soccer field. Use your finger to "kick" the ball as you play against a friend. The field is always open and ready for action! We've also launched another exciting sports app, Volleyball To Go, in which you can direct a volleyball player into pre-set actions to return a volleyball when playing against a human opponent. Enjoy the sun and the sand today! Finally, just in time for the holidays, we've launched Toys To Go. This fun app gives you the chance to help Santa by stacking presents on his sleigh. Can you make Santa happy? Be careful because the pile can topple over and you'll lose presents! Enjoy the new look to our website that streamlines the pages to make for easier viewing. We wish everyone a wonderful holiday season! Best wishes for a fantastic 2015! We look forward to the exciting new apps that we'll bring you in the new year! Have a Blast with Total Nuke! Magitech has launched another exciting new universal app for the iPhone and iPad, Total Nuke. Total Nuke is an easy to play missile defence game. You must stop incoming bombs that threaten to destroy the city. Tap to launch rockets to intercept the bombs and rack up a high score. Miss and the city will be destroyed. Click here to view the app in the App Store. Vertical Assault - Skirmish Mode! We have launched a new update to our Vertical Assault - Vietnam War app. Not only have we improved some speed issues, but we have added a new whole new campaign mode called Skirmish. This new mode allows players to name a battalion and participate in a series of different missions over a timeline that reflects the Vietnam War. The missions have variations such as timed, rescue or assault missions. The campaign ends when the timeline reaches the end of the war or if all the battalion helicopters are lost. Revisit Vertical Assault or take to the pilot’s seat for the first time today! Click here to view the product page for this universal app in the App Store. We have updated U-Boat Commander II and we will be updating Vertical Assault shortly with new leaderboard features. The update will also address some performance issues with the app. Halloween is quickly approaching and we have updated Halloween Pumpkin House by adding a new spider web design that you can select to enhance your creepy display. Buy or update Halloween Pumpkin House today and get set to enjoy Halloween! We have also updated Vertical Assault to work optimally on iOS 8 and for devices with retina displays. A new update for U-Boat Commander II will launch shortly to address some performance issues with the game. U-Boat Commander II is Ready for Battle! We are pleased to announce that U-Boat Commander II is now available for sale in the Apps Store. Man the battle stations and prepare for combat at sea! Take part in 15 thrilling missions. Avoid enemy fire from destroyers and submarines. Sink the enemy to become the ultimate U-Boat Commander! Compete against your friends and global submarine captains through Game Center. See if you can top the leaderboards! Click here to view the App in the Apps Store. We’ve also been hard at work optimizing many of our apps for the new iPhone resolutions and to work with iOS 8. We have updated Pocket Snow Globe and Halloween Pumpkin House. A new update is also coming for Vertical Assault - Vietnam War and more updates are on the way to optimize more apps in the future. U-Boat Commander II - Coming Soon! U-Boat Commander II will be entering the App Store soon! Prepare for the thrilling adventure! The game builds on the success of U-Boat Commander by incorporating high quality graphics with new boat models as well as beautifully animated water waves. The classic point and shoot torpedo system is back, but is enhanced by a new periscope mode for more accurate shooting. 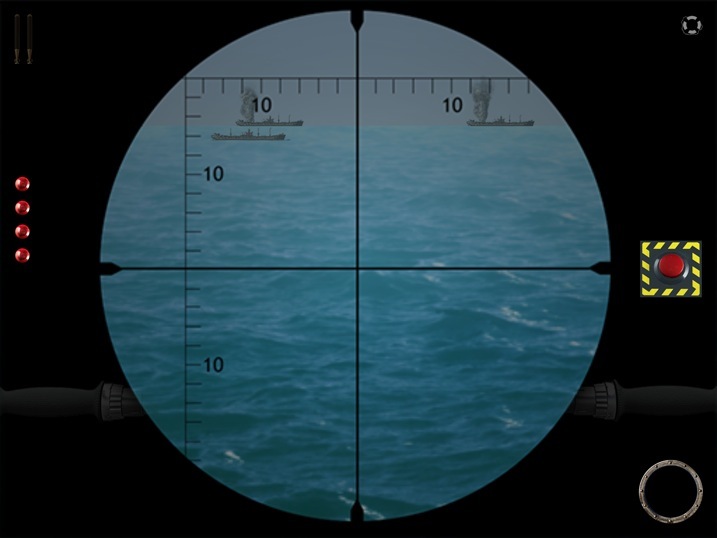 Following the path of enemy destroyers underwater has been improved by visual sonar beams as well as a red alert system, which shows players when destroyers have locked onto their position. Enjoy 15 missions in the German campaign. 15 additional missions with new submarines for the UK, Japan and American campaigns can be purchased as added content. You can view a teaser video for the game by clicking here. U-Boat Commander II - Coming this Fall! We’ve been hard at work on some exciting new projects that we will release later on this year. We’re pleased to announce that we will be launching a sequel to our popular U-Boat game, U-Boat Commander. In U-Boat Commander II, take to the seas again as you helm a U-Boat in several exciting missions. With new ships, more immersive graphics and several new game modes, U-Boat Commander II brings the intensity of WWII to life. See a working screenshot of this exciting game below. Prepare to dive this fall! Get into the spirit of St. Patrick’s Day a little early when you download a copy of Find My Clover. Go on a hunt for the elusive four-leaf clover in this exciting entertainment app. Beat the clock and see how many coins you can earn by finding all four four-leaf clovers. Click here to view the app in the Apps Store. In the spirit of spring and the upcoming St. Patrick’s Day holiday, Magitech is looking forward to the upcoming release of our newest app, Find My Clover. This fast-paced entertainment app gives the player a chance to sort through layers of three-leaf clovers in a hunt for the elusive and magical four-leaf clovers. Find four four-leaf clovers before time runs out or you lose the game. The faster you find the clovers, the more coins you’ll earn. Feeling lucky? Find My Clover will be available in the Apps Store soon. Over the last couple of months we have been working on updates to some of our released games. Water Dance and U-Boat Commander have been updated to support iPhone 5 and a new update for Bomber Captain will be coming soon.